This advertisement appeared in the July 27, 2012 issue of Los Angeles Daily Journal. 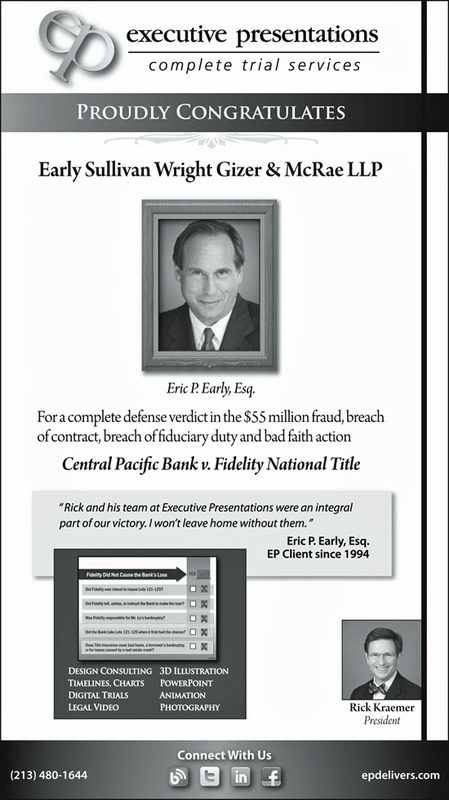 This advertisement appeared in the June 15, 2012 issue of Los Angeles Daily Journal. EP looks at the Prezi presentation software system and sees potential. Launched in 2009, Prezi is a cloud-based presentation software system that has opened up an exciting new dimension beyond exhibit boards and slides. With its zoomable canvas, Prezi delivers visually engaging presentations that lead viewers down a captivating path of discovery. Realizing the system’s potential for compelling use in the courtroom, Executive Presentations Design Consultant Troy White took Prezi for a test drive and came away impressed. What he liked most is its functionality in moving in and around a large graphical layout that delivered both a big-picture view as well as detailed and focused information in a unified way. Below is a screengrab of the title page of a demonstration Troy crafted to show an example of a timeline presentation and some of its possibilities: You can view and move through this web-based demo on the Prezi website (for best results go to full-screen viewing available by clicking the “more” link in the bottom right corner). Troy looks at Prezi’s pros and cons after the jump. This advertisement appeared in the May 11, 2012 issue of Los Angeles Daily Journal. This advertisement appeared in the May 4, 2012 issue of Los Angeles Daily Journal. 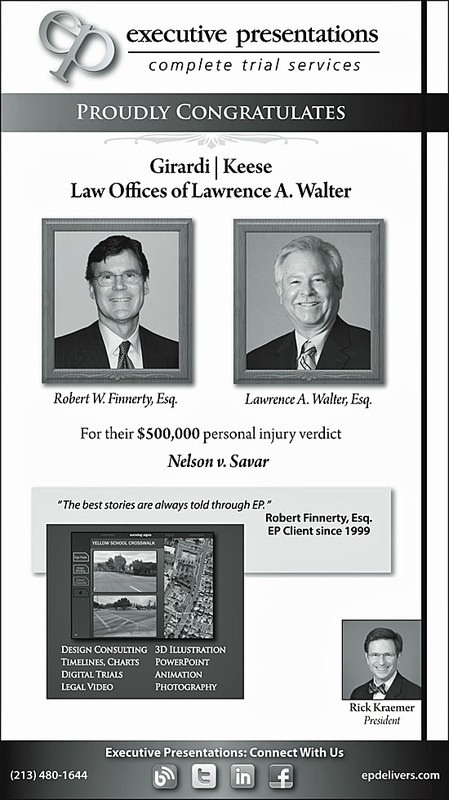 This advertisement appeared in the April 27, 2012 issue of Los Angeles Daily Journal. Presenting Executive Presentations’ Second-Annual Photo Gallery. The in-house exhibition is comprised of staffmember submissions on the theme of “Iconic Los Angeles.” Click on the individual thumbnails to view larger versions of the images.